Anti-Sadek Al-Ghariani posters that have appeared in Tripoli have been denounced by the president of the former General National Congress Nuri Abu Sahmain. He has accused supporters of the Qaddafi regime of putting them up, saying that anyone who agreed with them was a fool and a traitor to the martyrs who died for the revolution. 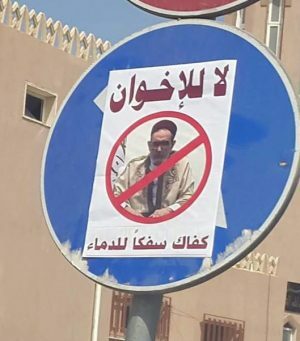 The posters, showing a No Entry sign pasted over a photo of Ghariani and saying “No to the Muslim Brotherhood” and “Enough Bloodshed” effectively accuse him of promoting violence in Libya. They are, however, believed to have been put up by Tripoli militia leader Haithem Tajouri who, it is rumoured, intends to arrest him. Support for Ghariani has meanwhile also come from the Derna, where the controlling mujahideen, supposedly supported by local elders, tribal leaders and civil society activists, have issued as statement stating that Ghariani’s Dar Al-Ifta (Fatwa House) is the source of legitimacy in Libya. The statement also said that any law at variance with Islamic law was null and void, that the Sharia was the sole basis for legislation, and the Dar Al-Ifta the only competent authority to appoint judges and to arbitrate on laws. Were Tajouri to arrest Ghariani, it would probably raise his popularity across the country despite the fact that he too is condemned by many Libyans, in his case as corrupt. Ghariani, however, has become far more unpopular and is widely ridiculed, particularly in Tripoli where he is nicknamed Sharshabil, after the malevolent wizard in the Arabic version of the Smufs cartoon series. Appointed grand mufti by the leader of the national Transitional Council, Mustafa Abdul Jalil, in 2011, Ghariani was sacked by the House of Representatives in November 2014 for his interference in political affairs. Even Abdul Jalil decided he had made a mistake and that Ghariani should go because he had lost the confidence of the Libyan people. Ghariani has raged in particular against Khalifa Hafter and the Libyan National Army, calling on Libyans to go and fight them and claiming they are a greater danger to the country than the so-called Islamic State (IS). Anyone who supports Hafter, he said, would go to Hell while those who died fighting him would be martyrs and go to Heaven. The allegation, however, that Ghariani is the face of the Muslim Brotherhood, does not tally with the facts. When not demonising Hafter, he is usually busy condemning the Presidency Council which the Brotherhood supports. The Brotherhood has been condemned by Ghariani suuporters for doing so. He is now at the centre of a nationalist, Islamist movement which includes the Derna mujahideen, the Benghazi Defence Brigades and other radicalised militias. While separate to IS, and rejecting its caliphate, it shares much of its ideology. Despite the contempt and ridicule for him, he is also seen as Libya’s version of Iran’s Ayatollah Khomeni – the country’s supreme guide.